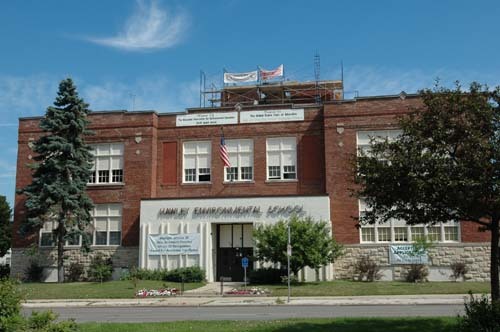 Hawley Environmental School is an MPS K4 through 5th grade Elementary School with a special focus on Environmental Education. We have a school greenhouse, Aquaponics lab, weekly environmental education classes, school gardens and other special programs and resources to support our special environmental focus. We offer an educational program that is centered on the global child of the 21st century. A strong academic curriculum and a professional teaching staff ensure all students achieve academic success. Our school has a solid history of academic achievement based on the state Wisconsin Knowledge and Academics Examination (WKCE). Hawley Environmental School has the honor of many awards and recognitions including: DPI/DNR Green and Healthy School (the first in MPS), numerous Herb Kohl Education Foundation Teacher Awards, Wisconsin Humane Society Teacher of the Year, mulitple winner of New Wisconsin Promise School of Excellence, Wisconsin Teacher of the Year for 2009, U.S. Department of Education High Achieving School, as well as other recognitions throughout the years. Our talented staff works hard to create an outstanding school community. Our school offers a well-rounded curriculum including music, art, physical education, technology classes, and Spanish. Student Hours: 8:45a.m. – 3:30 p.m.
School Office Hours: 7:45a.m.- 4:00 p.m.
Camp Hawley Hours: 7:00 a.m. – 8:45 a.m. & 3:30 p.m. – 6:00 p.m.